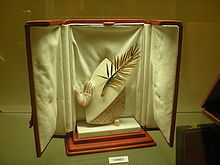 ↑ This particular Palme d'Or was awarded in retrospect at the ২০০২ festival. The festival's début was to take place in ১৯৩৯, but it was cancelled due to World War II. The organisers of the ২০০২ festival presented part of the original ১৯৩৯ selection to a professional jury of six members. The films were: Goodbye Mr. Chips, La piste du nord, Lenin in ১৯১৮, The Four Feathers, The Wizard of Oz, Union Pacific, and Boefje.